While we were in TN we stopped in a store that sold hermit crabs. The kids thought they were so cool. Of course, they all wanted one. Really? We told the kids we'd think about it. Mickey and I came to the conclusion that it wouldn't be awful but that we'd wait until we got home to get them. They'd probably die on the drive home. That would have been a total waste of money. 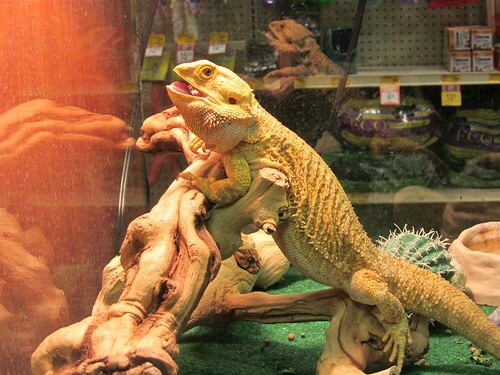 So today we took the kids to a few pet stores to look around. I'm not against having a pet but I don't want to be the sole care giver. I told Mickey I would be alright with a lizard if that was alright with him. Meg has been begging for a Leopard Gecko for a while now. We saw some and she got all excited. But the rest of us thought these guys were cute. 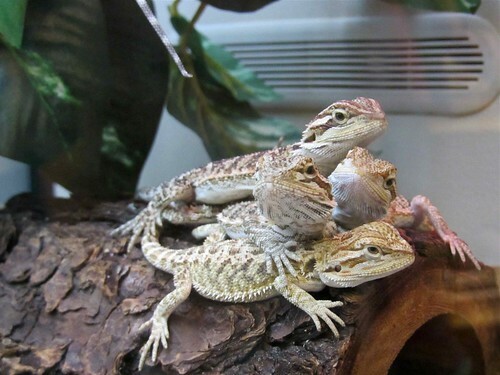 Don't you think these baby Bearded Dragons are darling? They were running all around and some would follow us. They had such fun personalities. But then they grow up to look like this. Which isn't bad, it still had a fun personality. We got to witness an employee feeding it live crickets and it kind of grossed me out. I announced right then and there that I would not be doing that bit of care giving. As for getting a pet...the jury is still out. More research needs to be done. The parents need proof from the kidlings that they can be responsible for more than themselves. Most days that proof is not evident. We took care of our neighbor's bearded dragon twice this summer and even though we survived the crickets (which the kids loved and I hated), none of us were a fan of the smell after 5-6 days. Phew! I was glad to pass that guy back to his owners! Good luck choosing something.